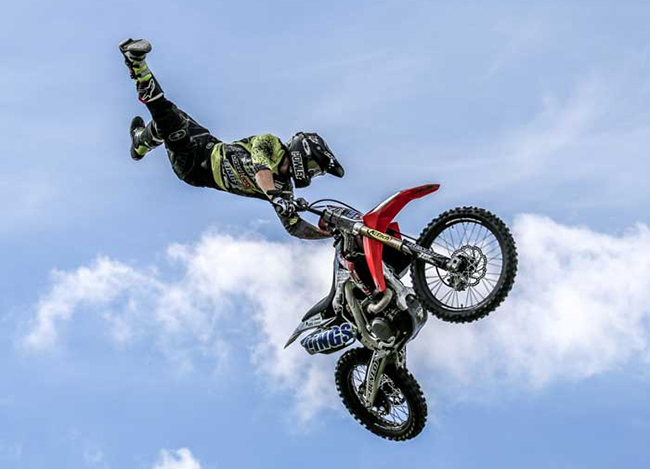 DODGE CITY, Kan. – The high-flying spectacle that is the Wisconsin Freestyle Motocross made an impression on rodeo fans in southwest Kansas three years ago. It was such a message that members of the Dodge City Roundup Rodeo committee have asked WI-FMX to return for this year’s rodeo, set for 7:45 p.m. Wednesday, Aug. 1-Sunday, Aug. 5, at Roundup Arena. “People really liked them,” said Elaine Gall, Roundup’s office manager. “We like that they’re completely different from most Western events. It’s an exciting thing to watch. People stayed around to watch them. WI-FMX brings its own ramps and sets them up inside the arena right after the bull riding each night. Then they will have two members on dirt bikes and one on a four-wheeler doing tricks and jumps that are amazing to see. “One of the things that make our show unique is that quite a few of us can ride motorcycles and jump four-wheelers,” said Cody Cavanaugh, the founder of WIFMX, based in Neenah, Wis. “I like the way we’re diverse in that way. That’s what makes WI-FMX unique. The overall entertainment of Roundup Rodeo is already a great value, but the X Games mentality that is motocross gymnastics makes it even greater. That has paid off for the men involved in WI-FMX and for the fans that get to watch them do their work.